There are many different reasons why garden lighting is important. Lighting in both the front and back garden will increase visibility at night, making trips and falls less likely and improving visibility for visitors approaching your front door. Garden lighting can also deter burglars, who will be less likely to steal from a home if it looks occupied and if there is a greater chance of them being seen. It also gives you a chance to enjoy your outdoor space at all hours of the day, and can add a touch of drama - if done in the right way. 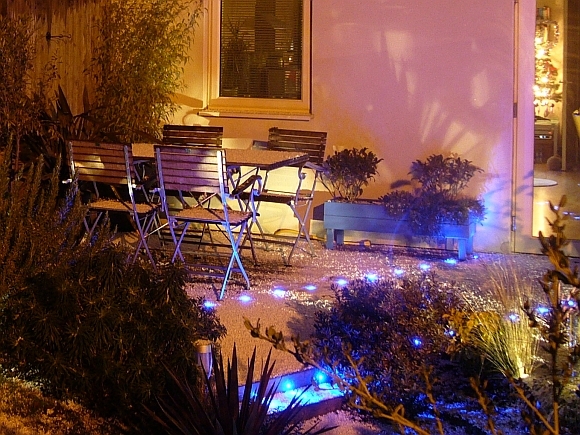 Security lights serve their purpose of deterring intruders and allowing you to see a clear path, but softer, more dynamic lighting can change the atmosphere of your garden completely, creating light effects and shadows that can look almost magical. Different styles for the patio, plants and the outside of your home itself can transform your outside space, whether you opt for mains-powered or solar options. Solar lighting options are generally more low intensity and release a softer glow than many mains-powered options: use along pathways to highlight without turning them into a feature, leaving you to focus on the rest of the garden. Backlighting is one of the outdoor lighting options that gives the most dramatic effects. Lighting up the back of your garden can turn everything into the foreground into a feature, creating shadows and giving a dramatic feel. Individual features, such as plants or statues, can be lit using a spotlight to bring them to the fore, and trees also benefit from this lighting type. Consider also placing a couple of lights within the branches of a tree to highlight its form, or use strings of outdoor fairy lights for a touch of magic. Water features can be transformed by using underwater lighting (if the water is clear), and elements such as fountains can be individually lit to provide a focal point which looks fantastic with the movement of the water. Steps should always be lit to ensure safety - one of the most elegant ways being to use solar spikes or spots with dimmer bulbs to avoid glare and to look good. If lighting seating areas, such as benches or outdoor dining spaces, down lights are better than uplighting options as they will avoid too much dazzle. Pendant lights, such as the outdoor harbour lanterns available from Castlegate Lights, can be hung from tress and gazebos to create a look that is contemporary and bright enough for post-sunset drinks. It is important to bear in mind, however, that poorly designed garden lighting schemes can be harmful to animals, create glare, run up enormous electricity bills and shine unwanted light into the house. When planning your outdoor lighting scheme, be careful to consider positioning, lighting style, colour, wattage and controls such as motion sensors, timers and dimmers to ensure that your outdoor space not only looks fantastic, but is as effective and as efficient as possible.